Haredi lawmaker says Nationality Law a threat to haredi community in Israel, urges peers not to back it. 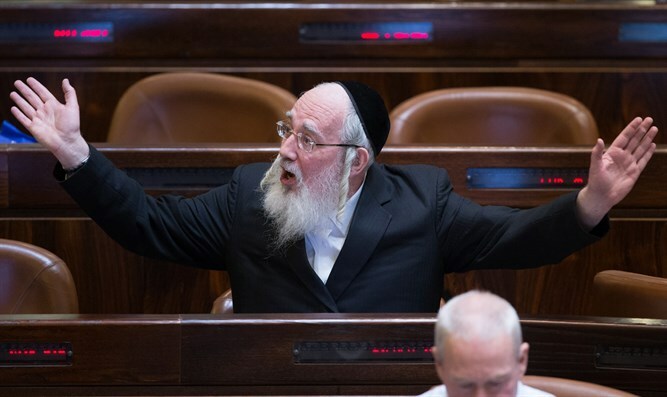 A senior haredi lawmaker warned that the proposed “Nationality Law” could threaten the haredi community in Israel, and urged his peers not to support the bill. On Monday, MK Yisrael Eichler (United Torah Judaism) penned a letter to fellow haredi lawmakers, urging them to reconsider their support for the Nationality Law, warning that it would empower the Supreme Court to offer its own definitions of Jewishness, nationality, and other concepts dealt with by the bill. The Nationality Law, backed by the Likud-led coalition government, would establish in Israel’s Basic Laws the status of the State of Israel as the nation-state of the Jewish people and the right of the Jewish people to self-determination in its homeland as a unique right for the Jewish people. It would also anchor the symbols of the state, Jerusalem as the capital of Israel, the Jewish calendar as the country's official calendar, and the Hebrew language as the official language. The proposed legislation initially included a provision, Clause 7, which would permit some towns to maintain entrance committees, limiting the sale or renting of homes to specific sectors of the population in order to preserve the town’s unique character. The latest draft of the bill, however, amended the clause, limiting the right of town councils to form entrance committees.